Seeing an empty jar, bottle or tube of skincare or makeup now gives me as much pleasure as buying a new product does. Doing empties posts has helped me use up products in my stash regularly - it gives me such a good feeling when I throw away all the empty containers and packs at the end of each month. If you find you are a serial hoarder, I suggest hanging a little bag on the handle of your shower door and tossing in empty products so you can take a picture of it all at the end of the month and then throw it all away - you will be surprised by how much you use up, just so you can throw the jars in the bag and get your empties photos done! I managed to use up a number of beauty products in October 2014. For one thing, I had a bunch of half-full, half-empty products. For another, some of them were nearing the expiry date. 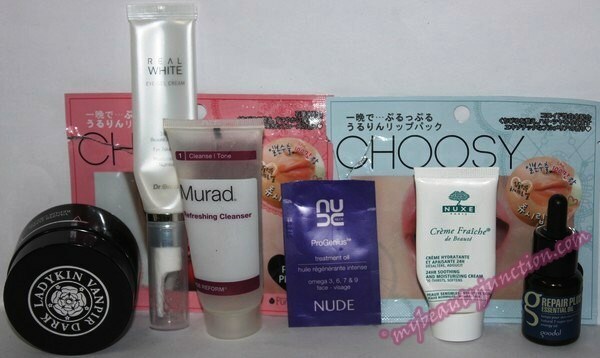 Thirdly, because I travelled, I used up travel-sized and sample-sized products easily. It was all skin or hair care, though. I did not finish up any makeup. 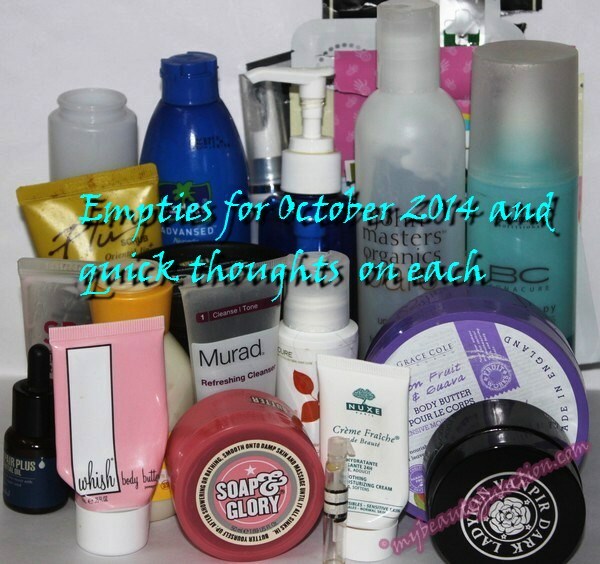 Take a look at the beauty products I emptied in October 2014 and my quick thoughts on each. I love this for hydrating my dry hair. This is a bi-phase spray which I usually use over damp hair, before styling. It also detangles very well. Repurchase? Have done. Think I have two bottles in stock. This contains a bouquet of oils including peppermint, neroli, spearmint, sweet orange, olive, nettle, grapefruit and so on. I loved it as a hair pack, pre-washing, and this is my second tub of the stuff. Repurchase? Not now, I just bought a few other hair packs. I bought this in the summer after reading great reviews. Unfortunately, all forms of coconut oil - okay, most hair oils - give me a major stiff neck, and this was no exception. I have been using it on my elbows and knees for some months and finally finished this up. 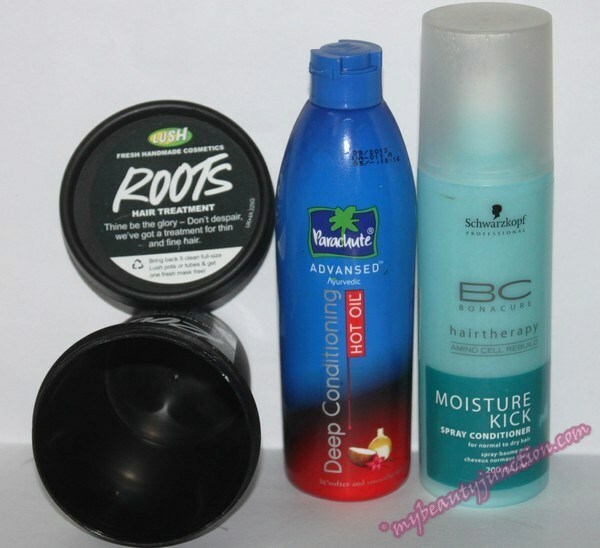 I am never going to buy one of those hair-care Memeboxes again, because most of their products contain menthol or something like it. Which is fine if you like the cooling sensation on your scalp in a hot shower - I don't. L.O.V.E. this product forever and ever, world without end, Amen - see my review here. I have a full-sized bottle and two travel-sized bottles, apart from these sachets which are good for one use. I took them along while travelling, and it was good to smell of cookie-batter in the middle of the forest. Get it at LookFantastic or Feelunique. This is a detangling conditioner which I finished up while travelling. It is unscented. 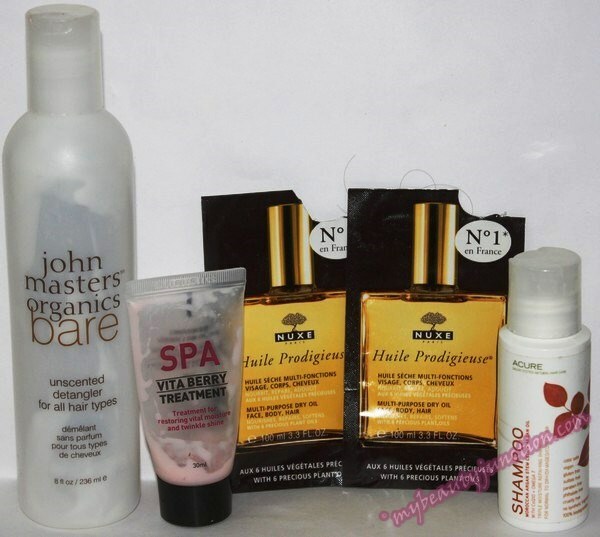 I really love John Masters Organics products. While this was not a miracle-worker on my dry, frizzy hair, it did serve as a nice regular conditioner. Came in my Vegan Cuts box - a sulphate-free, vegan shampoo I love! I cannot find the conditioner, but this came along with my during my trip. Repurchase: In a jiffy, if I can locate where. What I said about Korean hair care. I have a tube of the Vita Berry shampoo lying around, but I will probably use it to clean my brushes or something. This did nothing for me. Paraben-free, not tested on animals and reasonably priced, I am lucky to find Grace Cole products right next to my home. The British brand is now my favourite for all-over moisturising. 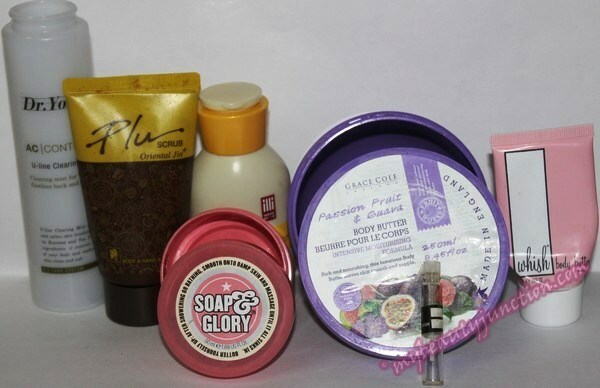 I have reviewed these body butters here, if you want to take a look. Repurchase? Ha! I will show you my Grace Cole haul over the next week. A close runner-up to the title of my favourite body butter, The Righteous Butter and Grace Cole body butters are very similar with the latter pipping the former simply because of lower pricing and easier availability. The Righteous Butter smells amazing, and this sample size was perfect for travelling. 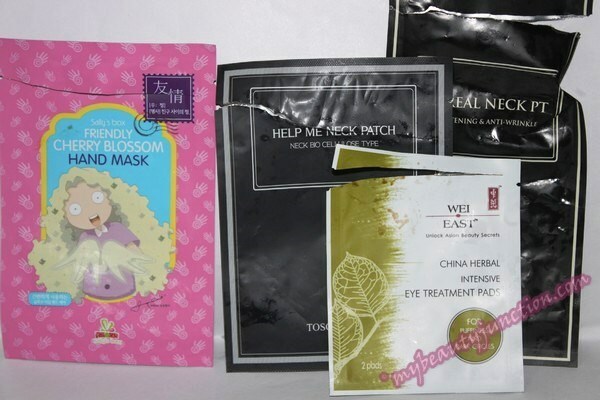 These are also not tested on animals and are paraben-free. This tub was enough for four uses, but the full-sized tub is 300ml, like Grace Cole. Repurchase? Yes! Maybe another from their range, such as the Daily Smooth. From a Memebox. This was a body scrub. While the granules - not microbeads, hurrah - were very tiny, they were also extremely gritty and felt harsh if you gave a good scrubbing. Soap & Glory's Flake Away has larger, but gentler granules which dissolves nicely. Repurchase? Er no, I'm a Flake Away person. I got this sample in a beauty box swap. There was enough for four uses, which is why it came along with me during my trip. I loved the gentle fragrance, though it felt a little.. siliconey, if you get my drift. This is the first time I am using Whish products. I have a tube of Whish Shaving Cream, which I will be trying out soon. Repurchase? Doubt it - I am too loyal to Grace Cole and Soap & Glory for moisturising. This came in a Memebox. The size was perfect for travel and lasted well over a week; great for sticky days out in the sun. It absorbed easily. Repurchase? Too many body lotions to be used up, so no. One of the early themed Memeboxes was the Free From Oil and Troubles box, where I got this spray. It was meant to fight bacne, chest acne, shoulder acne and so on. Sadly, it did squat. I think body butters do a better job on my bacne than this. Repurchase? I would be mental! Hurrah, a face cream that did NOT break me out. At all! It came in my OMG 2 Memebox. While it felt a tad too siliconey, thankfully, silicone-based products do not trouble my otherwise-sensitive skin. I used this at night, above my serum. It was too heavy to use below makeup. Repurchase? Have a tonne of face creams to get through. Let's see how the others do. This eye cream from a Memebox, combined with seven to eight hours sleep AT NIGHT over the last one month, and a beautiful break up in the cool mountain, has helped with both under-eye dryness and dark circles. Now if only I can manage to drink more than three glasses of water a day, and gym more than three days a week, my skin would be great. The downside is that it is not as neat below makeup, but great for the night. I love that this comes in a pump rather than a jar. I have four eye creams to be used up. Once they are done, this is it for me, unless one of the others does better. I am a huge fan of Murad skincare. This is actually an "Age Restoring" cleanser, so I have no idea if it does what it says. I can tell you that it is one of the gentlest cleansers out there. On the other hand, it does not remove makeup very well, and I end up with foundation traces on my Foreo Luna. But it is great for the mornings. Get it on LookFantastic or Feelunique. If I had to choose between Murad and Nuxe, I would go with Nuxe every single time. Love this cream. I took it along as a face and neck moisturiser while travelling and there was enough for the duration of my trip. It was very soothing and cooling after the dry mountain air made my skin a little flaky. LOVE this! Repurchase? Already have two more travel-sized tubes from Nuxe gift sets. This was the first time I used a facial oil. I used it very sparingly because - breakouts. Thankfully, it did not, but that could also be because I only had enough for two uses. I will have to try more products from this brand. Okay. Broke me out. How do I know? Because the first time I tried this Memebox product, it had broken me out and I retired it. I used it up now on my - hair. Because the label says it can be used on the hair. It was nice as a pre-styling oil. I like using these Korean lip masks for intense hydration on the lips once in every few days! Repurchase? I keep getting them in Memeboxes. I used up three of these in one week because my feet were so, so dead after all the trekking and rock-climbing I did. A brand new pair of socks gave me sock-bite (yes, like shoe-bite) and these masks gave my poor toes some much-needed TLC. Repurchase? 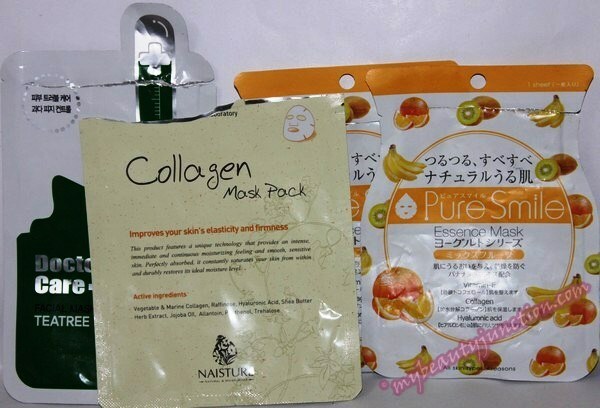 Sad part is, I cannot find these as often as I want, so I am planning to try out Missha's packs. Where can I find more of these? I got this in a beauty swap. It made my eyes brighter in the morning. Want to try out more before I give out the verdict! One was a nice hand mask, while the other two were my first-ever neck patches. They were very moisturising. I would love more of these in Memeboxes. Repurchase? Getting more such products regularly in Memeboxes. Of these, the first one was best, followed by the second one. I am not a huge fan of tea tree-based products. What beauty products did you finish off this month? Disclosure: No PR samples. Affiliate links.